#Chinkororo : CS Fred Matiang'i praises outlawed group Chinkororo citing Gusii to Vote or else will vote forcefully. -Governor James Ongwae shocked. - Bana Kenya News, Real African Network Tubanane. Home featured News #Chinkororo : CS Fred Matiang'i praises outlawed group Chinkororo citing Gusii to Vote or else will vote forcefully. -Governor James Ongwae shocked. #Chinkororo : CS Fred Matiang'i praises outlawed group Chinkororo citing Gusii to Vote or else will vote forcefully. -Governor James Ongwae shocked. The acting Interior Cabinet Secretary Fred Matiang'i has been bashed by the Kisii leaders saying that he is a member of an outlawed group Chinkororo and is protecting the group to date. Kisii Governor James Ongwae and Senator Prof Sam Ongeri alleged the CS for sponsoring an outlawed group in Kisii. He ordered the Chinkororo to evict anyone who will not go to vote as he will withdraw the Police. The Kisii people have been told to vote for President Uhuru Kenyatta whether they like or not. The CS praised the militia for protecting the Kisii-Maasai border. “I am in charge of security. The youth who are here if anyone tries to block you from voting, I can order the police to look aside and you rough them up,” the CS said. “Anyone who is joking does not know Chinkororo. I’m one of them,” Matiang’i said. “Let us unite with other people, Kenyans. The Gusii people are spread out across the country. 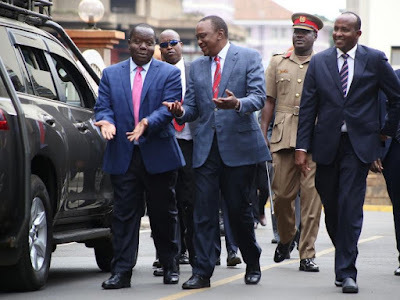 “We should not make decisions that may harm to our people.Let’s not join battles we know little about that might result to our people being killed,” Matiang’i said. “As your son, I’m humbly requesting one thing from you. Let’s not shame these leaders. Let’s vote for them. They love us and will announce the projects they have for us when in government,” he said. In 2007, militia gangs were heavily involved in post-election violence, which left more than 1,500 people dead. The Governor and the Senator said if anything happens to the Gusii community then the acting CS will be held responsible. Speaking in a Mashujaa day preparation in Nyamira, the two leaders claimed that the acting interior CS Matiang'i was not the first one from the community appointed as a minister and he urged the CS to use Wisdom in his actions.